As part of our Jordan Classic coverage, Finish Line polled 12 of the finest up-and-coming players in America about what it means to them to play in the game that bears Michael Jordan’s name, among other topics. Our final interviews this year are with Kentucky-bound center Skal Labissiere and incoming Ohio State guard Austin Grandstaff. A talented shooting guard from Texas, Grandstaff is heading east to play for the Buckeyes and Thad Matta. A devotee of Duke-era J.J. Redick, Grandstaff averaged nearly 30 points this past season. I think I saw this right, it’s your first time here? Yeah, first time in New York City. It’s a lot different from Dallas! It’s a lot busier. But I like it, I like it a lot. What’s been your favorite part of the trip so far? Just getting to know everyone, all the guys. Being around people who have the same goals as you and that you can relate to, it’s pretty cool. You’re a bit young to have really watched him, but when someone brings up Michael Jordan, what does he mean to you? He’s the greatest of all time. I mean, I don’t think I really got to watch him when he was in his prime, but I’ve seen so many highlights of him, and the stuff he could do was just amazing. You don’t see people doing it that way today, like his all-around talent and just his mentality. It never changed, and that’s what I admire the most. When I was younger, for me it was all about Michael Jordan, and then later it was LeBron James. As a basketball guy, who would be your version of that, someone you look up to and perhaps emulate? I like Steph Curry a lot. I mean, he’s on his way — I think he’s having an MVP type season. I love his game, and that’s who I really look up to and model some things after, how he can create his own shot and then hit open shots too. I love it, I love Steph Curry. You’re kind of following in the footsteps of another player next year in D’Angelo Russell that a lot of people compared to Steph Curry. I mean, me and D’Angelo are different players. He’s a great, great player, but I’m not really worried about personal goals, I just want to help the team win, so whatever I can do. Since this is your last high school game, what do you need to work on to get ready for the next step? I’m not ready yet, but I will be ready! (Laughs) I’ve been working with weights, trying to get a lot stronger and quicker, but I think I’ll be ready when that time comes. A multitalented big man with shot blocking ability and a terrific jump shot, Labissiere is a perfect successor for Karl-Anthony Towns at Kentucky. 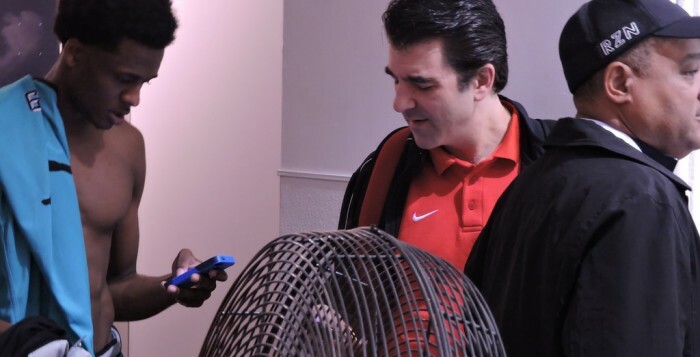 The Haitian refugee had 11 points, 12 rebounds and two blocked shots in the Jordan Classic. Labissiere is ranked No. 2 in the 2015 ESPN 100. What players jumped out at you? Allonzo (Trier), definitely. He’s a dog! (Laughs) He kind of reminds me of Russell Westbrook, because he’s always in attack mode, every time he got the ball down there, he’s so aggressive going to the rack. He doesn’t care how tall you are, he just has a big heart. Have you talked with Coach Calipari about what he expects from you? Yes sir. He’s very excited for me to get there and start working, and I’m very excited to see how much better I’m going to get as a basketball player. So I can’t wait to get on campus. I’m a big fan of Karl-Anthony Towns and how he affects the game in many ways. I thought you did the same thing tonight. I was wondering how you felt about the versatility you bring to the court. It seemed like you were everywhere. I just try to be active and do my job out there! If I have to switch off and guard the guards, I’m going to do that. I just go out there and play, just have fun with it. Basketball is supposed to be fun, so I just do whatever I can to help the team win. Well, it was so much fun to watch you play. What does Michael Jordan mean to you? Michael Jordan is basketball. (Laughs) He’s just the greatest player! I’ve heard so much from him, watched his games on NBA Hardwood Classic. He was the greatest of all time. It’s just an honor, a blessing from God, because a lot of kids wish they were in my position playing in this game out there, representing his brand basically. And we did a pretty good job of going out there, playing hard and representing the brand in a good way. Last thing, do you have a favorite Air Jordan? Not really, I’m not a big sneakerhead! (Laughs) I’m not big on sneakers. 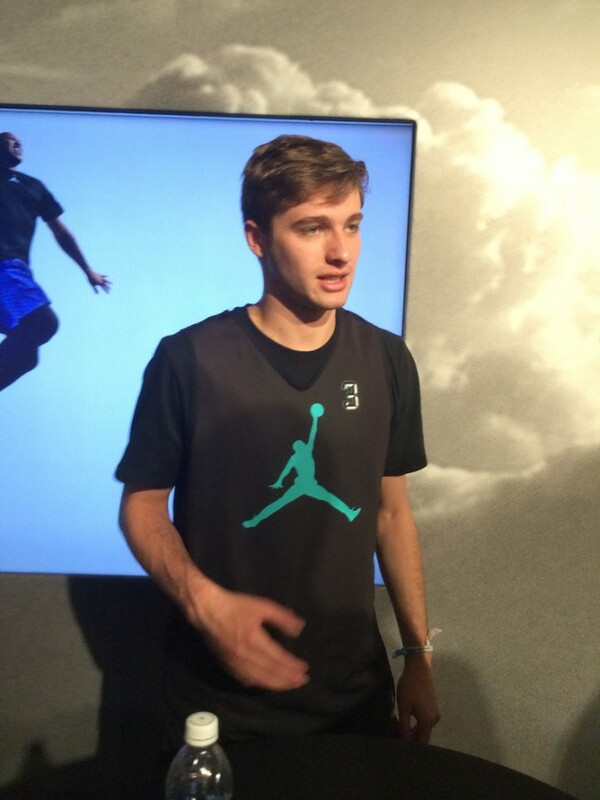 **Our coverage of the Jordan Brand Classic wraps up later today with an interview with Austin Grandstaff. As part of our Jordan Classic coverage, Finish Line polled some of the finest up-and-coming players in America about what it means to them to play in the game that bears Michael Jordan’s name, among other topics. We also solicited perspectives from Knicks executive and former All-Star Allan Houston, plus ESPN national recruiting director Paul Biancardi. Before joining ESPN as its national recruiting director, Biancardi had a distinguished career as a coach, including serving as an assistant for an Ohio State squad that made the Final Four in 1999. A Boston native, Biancardi came to ESPN in 2006, calls high school games and hosts ESPN Recruiting Nation. He also serves on the committees for the McDonald’s All-American Game and the Gatorade National Player of the Year. Does anything set the Jordan Classic apart from the other games? Well, obviously the stage. The Barclays Center is a big-time setting for the game. In terms of the game itself, it’s one of the most high-profile games in the industry. If you’re a player with upside, especially NBA upside, you want to be selected to this game. What players have really jumped out at you? I saw you watching the West practice. He jumps out at you, doesn’t he? He jumps out as someone who can score the ball from anywhere on the floor. He can create his own shot with the dribble, with the shot fake, with the jab step — I mean, he has different ways to score the basketball, and he may be the most prolific of all the two-guards in terms of scoring. Last year, it seemed like the class was heavy on big men. This year, it seems like it’s more about the shooting guards. Well, the big men are still what make the class special. But the two-guards are what gives it value and depth. On our ESPN 100, it’s never an exact science, but there are 29 shooting guards, and then there are 16 centers, and then there are 21 power forwards. But the best players in the class are the bigs. There’s the most room for growth and upside, but there are some outstanding two guards, like you said. When you come to an event like this, what is it you’re looking to see? Because like you said, this isn’t a conventional game. First of all, I’ve evaluated these guys for four years, so right now I’m kind of just watching their mannerisms. I’m just looking at traits, I’m not really looking at skills anymore. I’ve seen each one of these guys hundreds of times. So what I look at now is the body language, the work ethic, the intensity. I look at the teamwork, I look at the unselfishness. I’m just looking for things that are going to help separate them in my mind. For instance, who’s going to play defense in the next hour here? Some guys will, some guys won’t. You mentioned Blakeney. Are there any other guys who strike you as coming right in and making an impact? I think Isaiah Briscoe’s going to make a big impact at Kentucky. He’s really matured in the last year. He’s really grown up a lot. He has a leadership awareness about him that he didn’t have before. He’s always been good, but he’s polished up his body and he’s polished up his game. So physically he’s ready, and mentally he’s in a good state of mind right now. I think Skal’s going to be terrific. I think Skal’s best basketball will be 3, 4, 5 years from now. But he’ll impact Kentucky. He has an Anthony Davis-like effect; he’s not the athlete Davis was, but he’s a better shooter at the same stage. He’s got that long, seven-foot frame of a shot blocker with skill — he kind of reminds me of Anthony Davis in some ways. You look at a guy like Grayson Allen, he didn’t capture all the headlines right away, but he ended up being a major contributor. Do you see any players out here who people aren’t necessarily talking about that much who might end up having that kind of impact? That’s a great question, because I always think about those guys. Just one point on Grayson Allen, he played on the Reach One Teach One AAU team with D’Angelo Russell and Ben Simmons. They told him if you’re going to play for us, you’re going to have to come off the bench. He accepted that, which showed me he was a real competitive kid. So I wasn’t surprised what he did at Duke at the end there. But to your point, I think Malik Beasley. Dwayne Bacon’s going to get the headlines at Florida State, which he deserves, because he’s the most gifted of all the two-guards. But Beasley is a guy who can be better than his ranking and better than the guys in front of him here. I really like his game; he’s a great athlete, good scoring guard, guy who always tries to get better. People aren’t going to know him today, but they might know him a year from today. I’ll give you another name who’s really good: He’s the least talked about of any of the top 25 guys, Deyonta Davis, going to Michigan State. He’s a great shot blocker, probably second best in the country behind Skal. He led the state of Michigan in shot blocks, 199 in a single season his junior year. He can score from about 12 feet facing the basket, and he’s a good rebounder, he’s an active player. I think he’s going to do really well, whether it’s the first year or the second year, but he’s a guy you’re going to say, ‘Wow! Where was he in everybody’s rankings?’ But he’s a top 20 guy. And he’s going to a coach in Tom Izzo who’s got proven history on his side with Zach Randolph, Draymond Green and Adreian Payne. 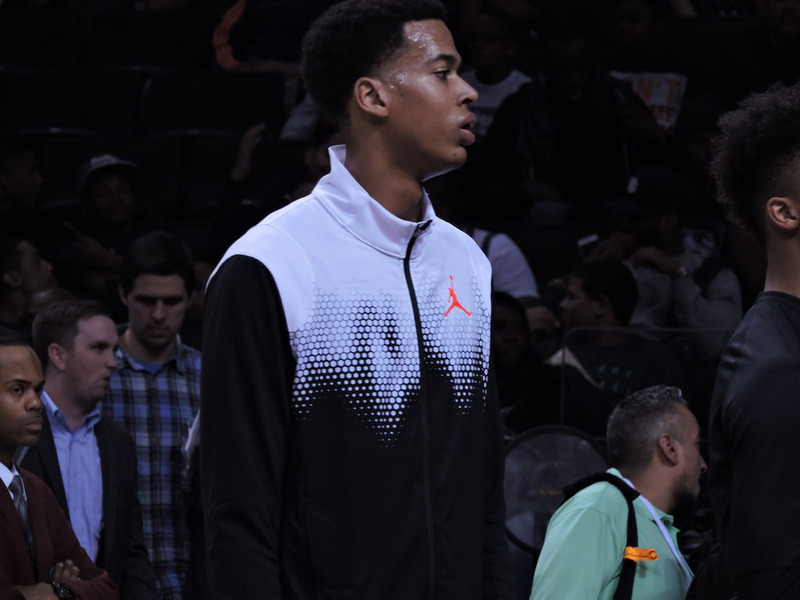 ** Check back tomorrow as we wrap up our Jordan Classic coverage with Skal Labissiere and Austin Grandstaff. Houston is best known for his nine-year stint with the Knicks, which included two All-Star appearances and a trip to the 1999 NBA Finals. Houston’s signature moment came in the first round that spring, when he hit a runner with 0.8 seconds left to beat the Heat by one point in the decisive Game 5. Houston is now the assistant general manager for the Knicks and serves as GM of the Westchester Knicks. Oh man. That was … that was a memorable year. It certainly was, for a lot of reasons! Competing against Michael back then, how impressive is it to see that all these years later, his brand has this much cache to have his own game, his own court, events like this? Well, it’s amazing. When you talk about legacy, it’s a big word that I’ve always learned that was important for me, my father and my family. And when you think about his legacy, it’s pretty incredible what his brand has been able to attract. And it’s amazing to see some of these young, talented players, and the fact that they can align themselves (with Jordan), it’s got to be pretty special for them. Putting yourself in their shoes, what mindset would you bring to an event like this with so many other top players and scouts and everything? I think just some leadership. If you’re in this environment, I think everyone knows how talented you are, and I think you just want to enjoy it — enjoy the moment, enjoy the situation you’re in. But also, just try to learn from your peers and just try to bring some leadership, and try to figure out what you can bring to your next school or the next environment you’re going to be in. Events like this have kind of gone from mostly college people here to mostly pro people, scouts and such. What do you make of the fact that things are kind of sped up in that regard? From our perspective, we’ve got to see them when we can see them. I think one of the biggest things you can do is to understand them, get to know these guys and what makes them, them. And that’s the biggest value that we can have is someone who hopefully someone who’ll be able to join this level. You’re obviously a basketball lifer. Do you just enjoy being around this type of environment with these kids coming up? I have a son who’s 14, I have children. I just enjoy the process of seeing them have a good time and living this moment in their life. They’ll never forget this, and I just like to see them enjoy this and learn as much as they can. 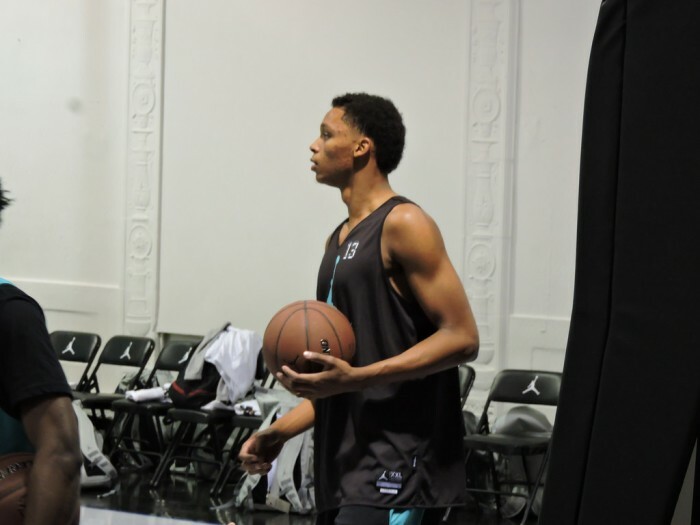 ** Come back later to get the insider perspective from ESPN analyst Paul Biancardi, and then check tomorrow as we wrap up our Jordan Classic coverage with Skal Labissiere and Austin Grandstaff. As part of our Jordan Classic coverage, Finish Line polled some of the finest up-and-coming players in America about what it means to them to play in the game that bears Michael Jordan’s name, among other topics. 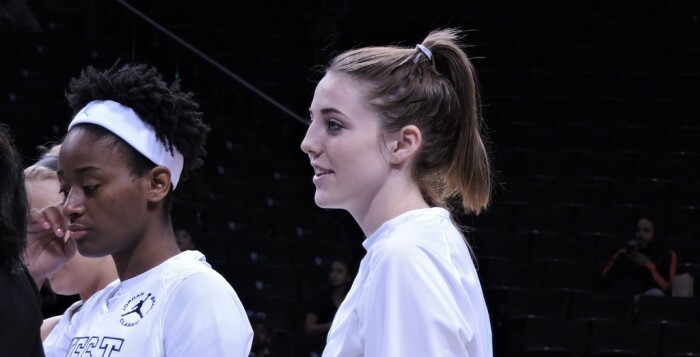 Today, the spotlight belongs to Katie Lou Samuelson and Stephanie Watts, who were proud to participate in the first Girls Game in Jordan Classic history. 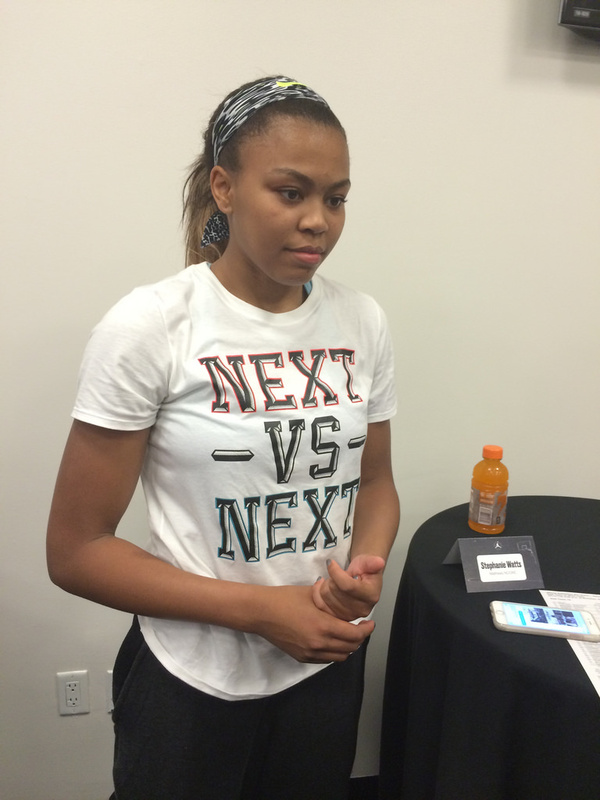 A slick guard known for her court vision and deadeye jump shot, Watts hit two three-pointers at the very end of the Jordan Classic, including the game-winner. A standout performer for Weddington High School in North Carolina, Watts will head to nearby UNC next year. A pretty good shooter went to UNC by the name of Michael Jordan. How does it feel to play in his game and hit such a big shot? To be here for the first girls Jordan Brand Classic is such an honor and a blessing. Huge thanks to Maya Moore for inspiring the idea for the game, I’m just so honored to be here. Do you have a favorite Air Jordan? Definitely the XI’s. We got them this weekend! It’s insane how much gear they gave us and how nice it all was, so it was great, the whole experience. Did you get to talk to Maya at all, and what wisdom did you take from her? A lot. She talked to us for an hour, so we took away a lot from that. She was just telling us what to expect in college, all the way to what you need to be eating, what you need to be doing, even the little things like stretching that really stuck with me. I’ve never been able to hit a clutch shot myself, I just freeze up. I know you’re just on autopilot, but does anything go through your head at that moment? It just felt like any other three, like the thousands of threes I take at practice. So I didn’t hesitate, since shooting is what I do. My coach told me early in the game, you might be a little off right now, but you’re going to hit the big shot we need. We were laughing about that later! Who did you enjoy competing against? 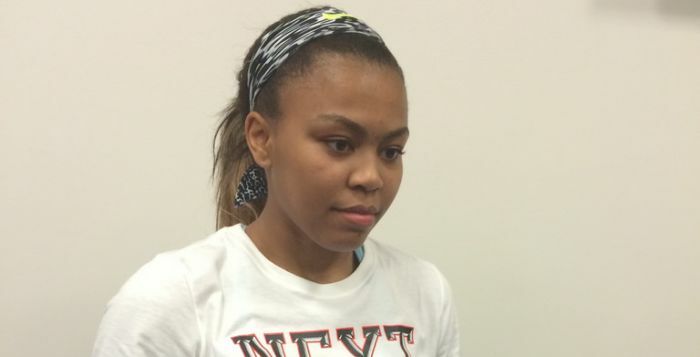 (Louisville-bound) Taja (Cole) is on my AAU team, so I love playing with her. She’s a terrific point guard, and it’s so much fun playing with a guard like that. My UNC teammate Destinee Walker is here too, and she’s a knockdown shooter, so it’s going to be so much fun playing with her. What do you take from this experience going forward? It was just a huge stepping stone. It was just an overall great experience meeting everyone, playing the game of basketball with such great players, it was just so great the entire week. 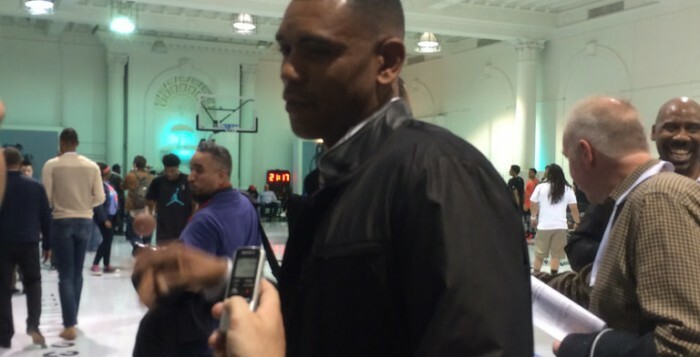 ** Stay tuned tomorrow as we continue our coverage of the Jordan Brand Classic with a couple of insider perspectives, Knicks executive and former All-Star Allan Houston, plus ESPN national recruiting director Paul Biancardi. ESPN’s No. 1 recruit in the nation, Samuelson excelled at all aspects for Mater Dei on both ends of the court. 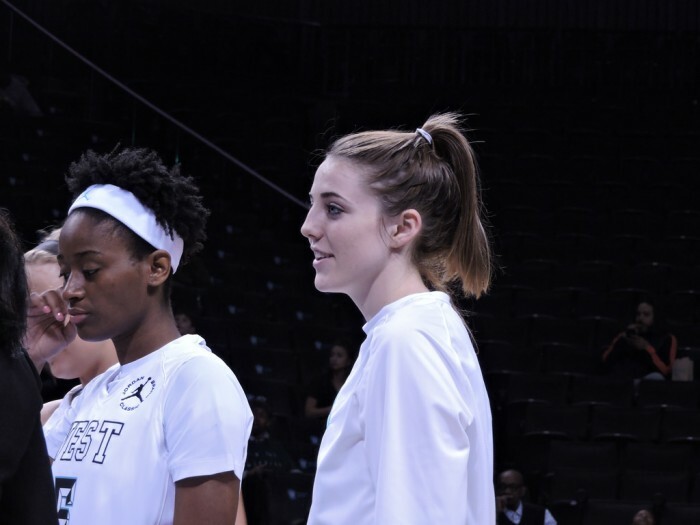 Unlike her two sisters, both of whom chose Stanford, the 6-foot-3 small forward will chart her own path on the defending champion Connecticut Huskies. 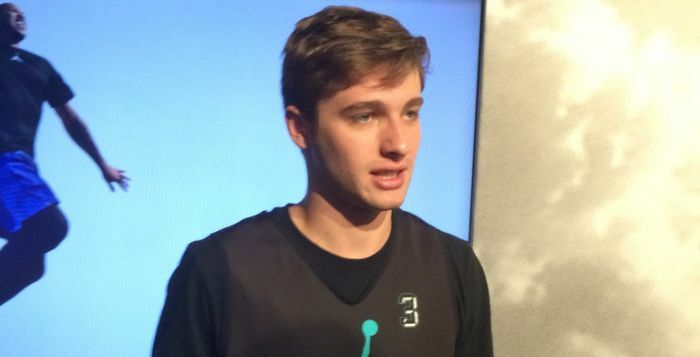 Samuelson attended the Jordan Classic, but did not play in the game to rest a minor elbow injury in advance of the U19 World Championship Trials in May. Is Michael Jordan someone you look up to? Definitely. He’s the best player there is. It’s really awesome to be here because it’s the first girls game, and we’re all just excited to be here. So far, it’s just being able to be here and be part of such a great event. We got to meet Maya Moore, and that was awesome. I watched her when I was growing up playing basketball, so that was really cool, and I know that we’re mostly here because of her, and she’s done a lot to help. In terms of being here for the first girls game, what does that mean to you? It’s such an honor, because when you go to (the McDonald’s All-American Game), you hear about all the girls who have gone before you. And now we’re going to be the first group. Years to come, people are always going to remember us as the first group, and that’s really an honor. Yeah, definitely, Maya Moore. Kevin Durant is my favorite player, I try to model my game after him. We’re both long, tall guards, so I like to watch him, though he’s been injured. In the girls’ game, it’s probably Delisha Milton-Jones. She’s been such a role model to me and helped me. I’ve worked out with her a few times, and she’s given me a lot of advice. What brought you to UConn? Is it just kind of where you always wanted to go? Definitely, though I have sisters at Stanford, so it would have been cool to go there. But when I visited, UConn was such a comfortable environment for me, and I really enjoyed being there. And I know Coach Geno Auriemma is going to make me the best player I can be, and that’s really what I look for in a college. I know your sister Karlie, who plays for Stanford, is very good as well. Does anything compare to competing against her? I mean, that’s always going to be toughest, because she knows me more than anyone else knows me. Playing 1-on-1 with her is really tough, but hopefully I’ll get to play against her again really soon! Last thing, are you a sneaker person? I was going to ask what your favorite Air Jordan was. I … wouldn’t know. (Laughs) But it’s been awesome at this event. I got my first pair of Jordans! 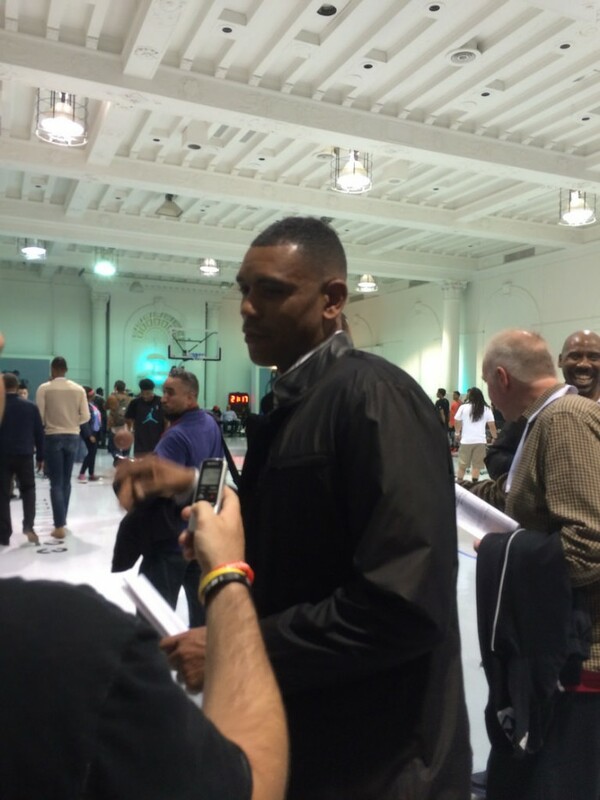 ** Check back later for Jordan Classic hero Stephanie Watts, and then stay tuned tomorrow as we continue our coverage of the Jordan Brand Classic with a couple of insider perspectives, Knicks executive and former All-Star Allan Houston, plus ESPN national recruiting director Paul Biancardi. As part of our Jordan Classic coverage, Finish Line polled 10 of the finest up-and-coming players in America about what it means to them to play in the game that bears Michael Jordan’s name, among other topics. 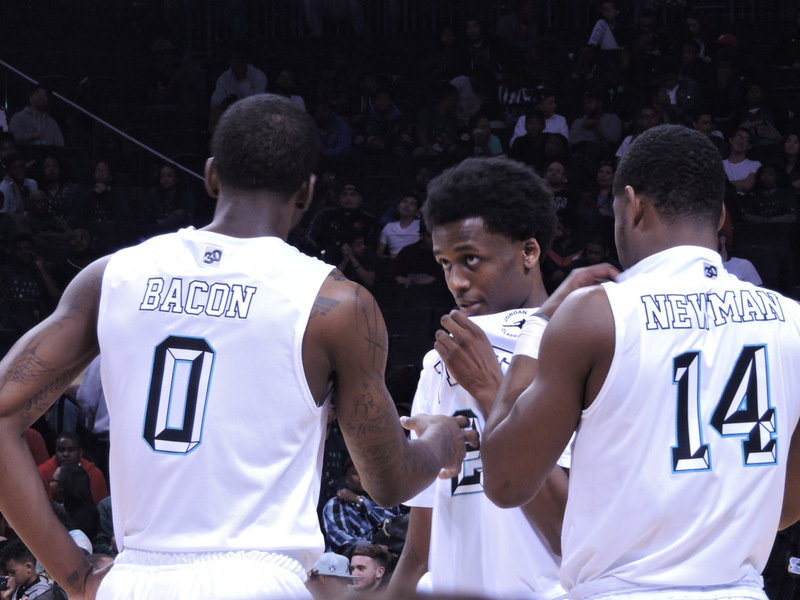 Today, the spotlight belongs to elite guards Dwayne Bacon and Eric Davis. Inspired by his uncle/mentor, Davis plays on both ends with a real chip on his shoulder. Davis averaged 26 points, seven rebounds and six steals this year for Saginaw Arthur Hill in Michigan. 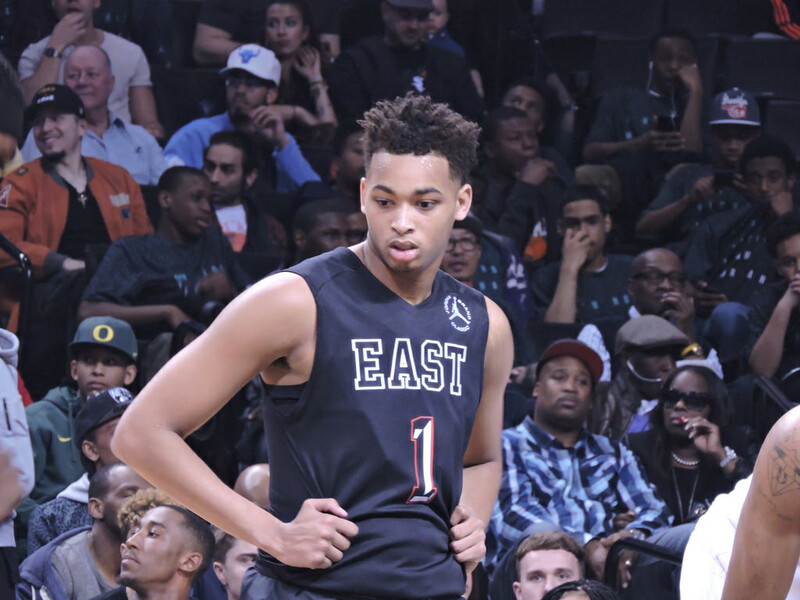 A Texas Longhorns commit, Davis was third on the East team with 14 points in the Jordan Classic. First off, tell me about your Uncle Tony and how he pushes you. He challenges me mentally. He sets goals for me, as far as things I need to work on. Like, steals: He’ll say, ‘Let’s get five steals a game.’ So in the first half, I would maybe get like one steal, and second half, he’ll be like, ‘You’re four short!’ Just little things like that to challenge me and get me going to push myself. If you can go in and challenge yourself mentally, even if you come up short that’s the mindset you need to develop, to do things you don’t normally do, like get 20 rebounds. Physically, he said, ‘You’ll be there, you’ve got the skill set.’ But mentally, he likes to train my mind. Hearing about that, it reminded me a lot of Michael Jordan, how he would almost create goals and obstacles out of thin air. Yeah, I picked that up along the way. Like yesterday, my goal was to be the best defensive player at practice. All of us here can score; I just want to be the best defender, and I think I was! Now today, it’s the same goal, but I’m adding to it: I want to knock down four jump shots, add a couple more steals. So I’m over there adding goals in my head to prepare myself for practice. What are you looking to show people when you play against competition this good? I want to show my all-around game. I want people to know me as a defensive stopper. Everyone just can’t shoot the ball, somebody’s got to play defense. I want to be one of those guys that’s locking down, that’s going to keep me on the floor. What sets this apart from other games is Jordan is actually here, spending time around the players. What does he mean to you? He revolutionized basketball. When I think of Michael Jordan, I think of the greatest player who ever played. He just inspires me, and it’s not just what he did offensively. His mental approach on everything was just, I’m going to dominate in every aspect of the game, not just one. That really intrigued me. It showed me that if I can get that mindset, maybe I can be one of the greatest. Why not me? If he can do it, I can. People overlook his mental approach, but I think that was the best part of his game, honestly. He was just so tough; when he was fatigued, he just willed through it and carried his team. That’s just one of those things I’m just learning, and I’m striving to have a mental game as tough as his. He’s also known for his sneakers. Do you have a favorite Air Jordan? Yeah, I’d probably say the 6’s. They’re pretty nice, and they’re comfortable to hoop in. 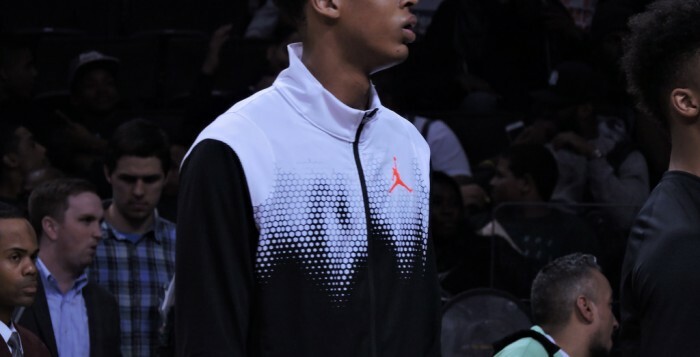 ** Stay tuned tomorrow to get the word from Kentucky-bound center Skal Labissiere and Ohio State commit Austin Grandstaff as our coverage of the Jordan Brand Classic continues. An explosive 6-foot-6 guard, Bacon returns from Oak Hill Academy to his home state to play for Florida State next season. He won the McDonald’s Game Dunk Contest by jumping over Jalen Rose; he also has a nice outside shooting touch. Bacon, who scored 8 points and had 5 rebounds in the Jordan Game, will share a backcourt with fellow top recruit Malik Hairston. I know you’re a pretty good dunker, just a little better than me! What’s it like to be at this game sponsored by one of the greatest dunk contest champions of all time? Yeah. [Laughs] I’m working on that. But it’s just a great experience to play here. He was the best basketball player in the world! So it’s just great to play in this game named after him. What would you say, if there was one characteristic of his you wish you could take for your game — physical, mental, anything? His mindset on the whole game, like the way that he wants to go into every game and play, no matter good or bad. He just wants to play; he just loves the game. And I just want to take that with me from him. So that’s the mentality you try to have? Yeah, I mean, when I step on the court, I’m ready to play at all times. Whether it be pickup, scrimmage, real game, I’m ready to play because I love the game. You had the experience of playing for a terrific high school team, and now you’re heading back home to play for Florida State. Was that important for you? I mean, it wasn’t really important — I wasn’t looking to stay home — but it’s just a great situation. I always wanted to play in the ACC, and I feel like I can walk into Florida State and compete for a spot right away, and hopefully take this team farther than they did last year. 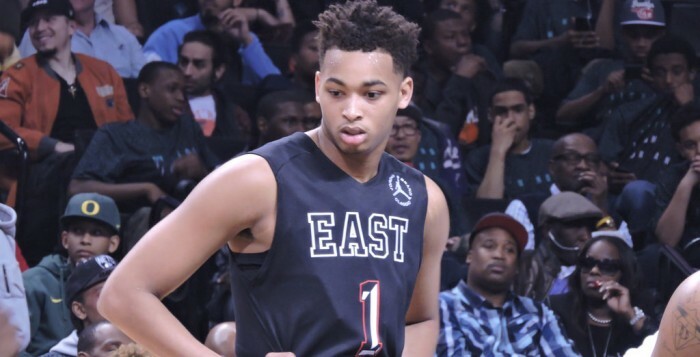 ** Stay tuned later today to hear from Eric Davis and tomorrow to get the word from Kentucky-bound center Skal Labissiere and Ohio State commit Austin Grandstaff as our coverage of the Jordan Brand Classic continues. As part of our Jordan Classic coverage, Finish Line polled 10 of the finest up-and-coming players in America about what it means to them to play in the game that bears Michael Jordan’s name, among other topics. Today, the spotlight belongs to Luke Kennard and Ivan Rabb. The No. 8 recruit in the country according to the ESPN 100, the Oakland native chose to remain in the Bay Area, instantly becoming the face of Cal. 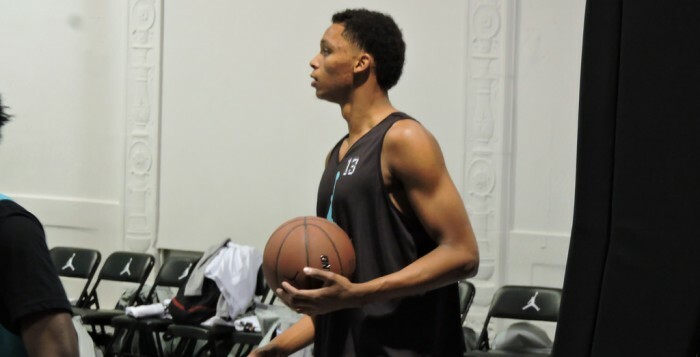 The 6-foot-10 Rabb is a talented scorer and a tremendous athlete who will only get more lethal as he gains strength. Rabb scored 14 points, 12 rebounds — and a three pointer — in the Jordan Game. I visited the Bay Area last year, and it was beautiful, I didn’t want to leave and come back here! You could definitely have picked a worse place to stay home and play college ball. Yeah, I mean, it feels great. I was kind of lost for words when I first decided, and I’m definitely happy. I haven’t been this happy in a long time. You’re at a game represented by arguably the greatest player of all time. How does it feel to have him watch you play? I mean, it’s exciting. I always wanted to meet Michael, so it’s great that he comes here to watch us play. I mean, I’m just happy about it. I’m excited, there are a lot of great players here, and for me to be one of these guys just definitely means a lot. Another thing about Michael, he was always comfortable being the face of a franchise, taking on that responsibility. People are going to kind of look at you like that. How does that make you feel? I think it won’t be too much different from what I’ve been going through the past few years. I’m definitely not going to take a lot of credit for it, because Cal has a lot of great players there already. They just need a little bit more help. I definitely wouldn’t have a problem with being the face of the program, but I just want to work hard and stay humble and win games next year. Obviously, you’ve had a few of these games these past few weeks. What’s your mentality coming to a game like this? Just to get something from the practices and get something from the games, and most of all just have fun. Sometimes it’s hard to have fun when you’re a big guy in these games, but I just want to do anything I can to have fun — and to help Zim [Stephen Zimmerman, standing right there] get a few buckets! ** Stay tuned tomorrow to get the word from elite guards Dwayne Bacon (Florida State) and Eric Davis (Texas) as our coverage of the Jordan Brand Classic continues.